¡Regístrese hoy y dígale a un ser querido! Đăng ký ngay hôm nay và thông báo cho những người quan trọng đối với quý vị. Get a family out-of-state phone contact and make a wallet card for each family member. Ensure that school emergency contact cards are regularly updated; ensure that each child has at least 2 people listed to pick him/her up if parents are unavailable. Select two family reunification points for use if the house is inaccessible. Select one place in the neighborhood, such as a friend’s home, food store, or other location well known to all family members. Select another location not in your immediate neighborhood, but easily accessible by all family members, such as your place of worship, a movie theater or a regional mall. 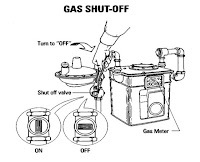 Locate your gas meter and learn how to use the gas shut-off valve and when to shut off your gas. Store heavy objects on low shelves or on closet floors, not on high shelves. Heavy pots and pans and storage boxes may fall during earthquakes and injure family members. Remove any heavy objects from overhead shelves in bedrooms. When people are asleep, they cannot protect themselves from falling objects. Water is a most important element. 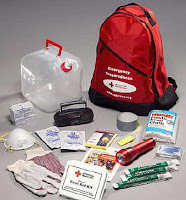 Each person needs one (1) gallon for drinking and food preparation each day. Additional water is needed for sanitation, clean up, and for pets. A dog will also need one (1) gallon a day and a cat will need at least a pint. 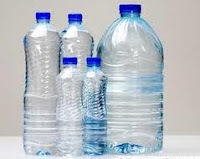 Storing water is easy. Wash and rinse clean, 2-liter soda or any other clear plastic juice bottles, fill them with tap water then add four (4) drops of liquid chlorine bleach (Clorox), the plain unscented type. Do not use the frosted type of plastic jugs that we buy milk and water in for storage purposes. These are for short time use and will deteriorate too soon for storage use. Keep some coffee filters available to be able to filter any cloudy or murky water you obtain during an emergency. Then treat it with sixteen (16) drops of Chlorine Bleach mix well and let stand for at least thirty (30) minutes before using. A little Tang or Kool-Aid can be added at the time of drinking to avoid the slight bleach taste. Copies of the tax bill, mortgage papers or property deed to prove homeownership; copy of lease to prove legal right to alternate shelter. A copy of the wills for each family member. Make sure that an out of area family member has another copy in a safe place, and that your legal adviser has a copy. Copies of funeral arrangements in place or last wishes for adults. Car Kit - have some simple things in your car. Think about yourself and family members. Water, some snack food, any required prescription medication, and any special needs for your children. Hat, jacket, blanket or shawl. You may need to keep warm. Writing paper, several pencils, a flashlight, (keep the batteries out of the flashlight until you need it. This prevents corrosion of the flashlight. Shoes you can walk some distance in. Ladies should avoid heels, open toes, and sandals. Simple personal hygiene and items for your comfort. Water, Food, and Medication should be changed weekly. Put a fresh supply into the kit and use what you take out. You do not have to buy extra and nothing spoils. Flashlight batteries should be replaced and used every few months. Shoes and extra clothes need not be new. Those that are out of style, may need a little sew-up, or have a stain, will work just fine in an emergency. Start small. Then build as you can. Begin, the rest is easy.